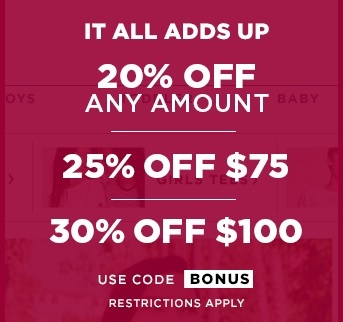 Old Navy Canada prepared a special sale offer which is valid at Old Navy Canada official website. More you spend spend, more you save. Use the promo code BONUS and take 20% off any amount you spend, or take 25% off your purchase of $75 or more, or take 30% off your purchase of $100 or more. The offer ends today, February 17, 2016. Official source of the information is Old Navy Canada. For more details about the promotion visit the official website.